This book is an instructional guide for use with MathRack products. 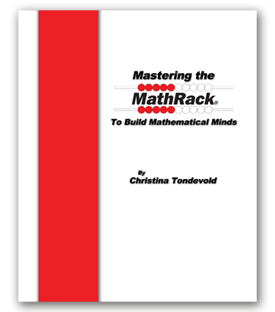 The original MathRack 20 was designed around the arithmetic rack from the Netherlands. This tool had two rows of ten beads; each row having five red and five white beads. The arithmetic rack is used to develop number sense and encourage children to use strategies instead of counting one-by-one. Since building the first MathRack 20 the company has manufactured other products that build up to the MathRack 20 and ones that extend children’s understandings beyond the MathRack 20. This book gives mathematics instructors the information they need to effectively use these powerful tools to their utmost potential. The optimal setting for these activities is in a whole class or small group settings. The activities can be done in one-on-one settings; however, children will not get the experience of learning from others and hearing how other children “saw” the mathematics. Whichever setting you choose, all of these lessons should be used in conjunction with your current curriculum as an additional representation of what the children are already learning. Each lesson can be done in a day, but should not be done and then forgotten. Many of the activities can become “mini-lessons” that can be done when you have 5-10 minutes of spare time, as “starter” activities that you do the first 5-10 minutes of math time, or as math center activities that children can do on their own or with you in small groups.